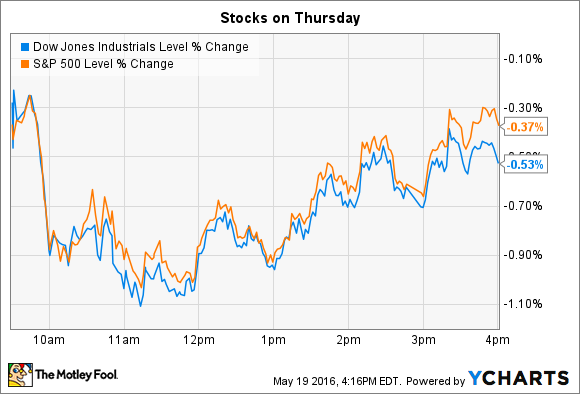 Why these stocks jumped even as indexes fell on Thursday. Stocks fell hard on Thursday morning, but managed to recover most of their early losses by the end of the trading session. The Dow Jones Industrial Average (DJINDICES:^DJI) lost 92 points, or 0.5%, and the S&P 500 (SNPINDEX:^GSPC) shed eight points, or 0.4%, to slip back into negative territory for the year. Several individual stocks managed to post solid gains even as indexes fell, though. Wal-Mart (NYSE:WMT) and Urban Outfitters (NASDAQ:URBN) made notable moves higher on Thursday following the retailers' quarterly earnings announcements. Wal-Mart's stock shot up 10% -- adding $17 billion of market capitalization -- after the retailer announced surprisingly strong quarterly results. Both sales and earnings beat consensus estimates as revenue rose 1%, and profits contracted by just 5%. In contrast, Wall Street was bracing for a 1% sales decline, and a 15% earnings slump. The company's nearly 2% uptick in customer traffic extended its streak to six-consecutive quarters of growth by that metric, while extending its lead over rival Target. Wal-Mart has been spending aggressively on improving its shopper experience through initiatives like higher employee wages and raising in-stock levels. These investments apparently helped keep cash-register lines humming, just as management hoped they would. "We are proud of the overall results in the first quarter, and there is momentum in many parts of the business," Chief Financial Officer Brett Biggs said in a press release. Those areas include grocery pickup and cost cuts that should enable lower prices over time. Yet the retailer still isn't happy with its e-commerce growth pace, which, at 7%, trails the overall industry. Wal-Mart's other key strategies seem to be working, though, and that suggests its business is in a stronger position than investors had feared. Urban Outfitters stock rose 14% to bring its year-to-date gain to 23% following first-quarter earnings results that trounced analysts' estimates. Sales and profitability rose as each of its three core brands -- Urban Outfitters, Anthropologie Group, and Free People -- contributed to growth. Gross profit margin expanded by a full percentage point, to 34% of sales, thanks to a significant pullback in price cuts. In an encouraging sign for the business, comparable-store sales grew despite those higher prices, rising 1%. "These results were driven by more-compelling product assortments, improved inventory management, and stronger marketing," CEO Richard Hayne said. Inventory turnover also posted a solid improvement, as overall inventory fell 10%. It wasn't all good news in this report. Urban Outfitters had to ramp up its advertising-and-marketing expenses to keep its customer traffic levels up. As a result, operating margin slipped, and pushed net income down with it, to $30 million from $33 million a year ago. Aggressive stock buybacks saved the retailer from posting an EPS decline. Executives said in a conference call with investors that they can weather the turbulence in the apparel retailing world, which they say is being driven by an oversupply of products, and not by a weakening consumer, through cautious expansion. "The careful, deliberate manner by which we grew the store base of all of our brands now serves us well," Hayne said.